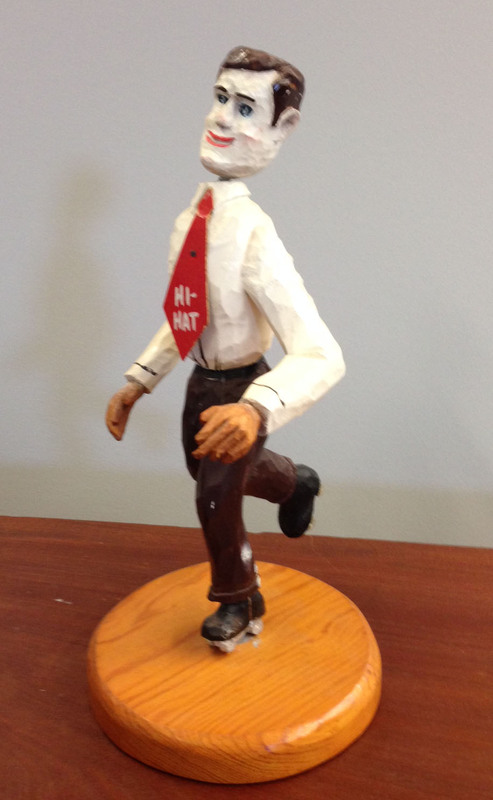 In our last post, we revealed how we learned that the Hi Hat figurine within our collection was carved in the likeness of former Hi Hat owner, Mo Rochette, who was also famous as the ‘old guy’ behind the snack bar at the Hi Hat during the 60s, 70s, and 80s. But to get there, we had to research the long history of Lowell’s Hi Hat, which dates back to the days of Prohibition in the 1930s. Few Lowell institutions evoke memories as fond as those associated with the Hi Hat Rollaway, once located on Princeton Boulevard. But, as we have seen before, even something as seemingly fun and innocent as a roller skating rink can have its detractors. Up until the summer of 1964, the Hi Hat hosted not only roller skating, but also record hops, or dances, as we call them today. Until late August that year. Just as the summer was coming to a close, the Lowell License Commission suspended the dancing license of the Hi Hat, one week after a group of 500 teenagers ‘jeered and threw stones’ at Lowell Police as the record hop let out one night. The lasting damage from this angry horde? Damage to a police cruiser and five arrests for disorderly conduct. But, it was enough to lead the Hi Hat’s neighbors to collect some 170 signatures on a petition demanding an end to the record hops. Even the city’s mayor, Ellen Sampson, didn’t have much nice to say about the Hi Hat. She complained that the teen girls there wore short shorts and the boys always wore dungarees and had their shirts untucked. She concluded by saying that “as a mother,” she would never allow her “daughters to step foot inside” the Hi Hat. It’s no wonder that the Hi Hat lost its dancing license in 1964. The Hi Hat started out a generation earlier, as a restaurant, back in the midst of the Great Depression, when it was owned by Wilfred Goodnow. 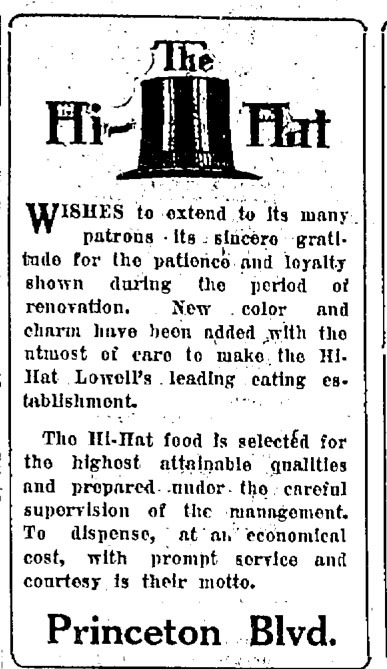 As early as 1931, advertisements appeared in the Lowell Sun for the Hi-Hat Food Shoppe on Princeton Boulevard. Even in these earliest days, during the Goodnow years, the Hi-Hat kept late hours, and was open till 1 AM. As the ad proclaims, ‘Noon lunch in our cozy dining room will surprise you.” By 1940, it had added a dance hall. The Hi-Hat was quiet in its early years. Its frequent ads in the Lowell Sun touted its fried clams and other food. After the mid-30s, liquor began to appear in its ads too. A spate of burglaries in the late 1930s moved the Hi Hat to the Sun’s front page. In 1937, thieves forced open a rear door in the dead of a late November morning in search of money and booze. They escaped with about eight quarts of whiskey, but found no money on site. That was the first break-in. No one thought much of it. Then, on Christmas Eve 1937, thieves broke into the Hi-Hat Restaurant again, for the third time in three months and this time made off with a bigger haul, including $100 in liquor, $50 of cigarettes, and about $7 in cash. A week later, on January 3, 1938, two Nashua NH men were arrested and charged with the break-ins. In the end, a total of seven men, between the ages of 17 and 23, were each sentenced to a year in jail, for their roles in the Hi-hat break-ins, and the break-in of a Tyngsboro restaurant named the Old Mexico cafe. 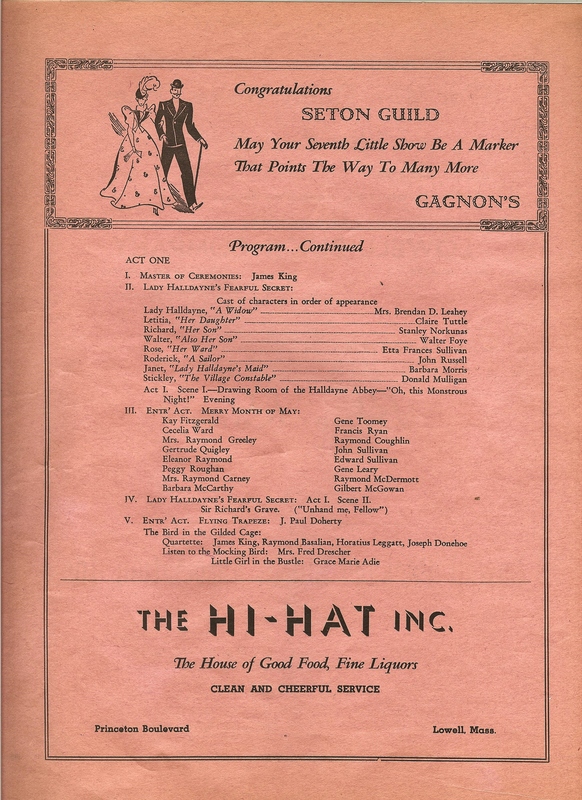 In November 1940, the Hi-Hat expanded, adding the Melody Room, and introduced live big band music, by Ray Harrington and the Hi Hatters orchestra, which was described as having “10 pieces of sweet melody”. Even though the Hi Hat had been already been a destination for parties and receptions for a decade, the addition of the Melody Room in 1940 expanded the Hi Hat’s profile in local dancing circles and put it on the map of the city’s night clubs. When the Hi Hat re-opened on November 26, 1940, as the city’s ‘swank new night spot’, its ads claimed that the Hi Hat ‘left nothing undone to its being the most modern and attractive dining hall north of Boston.’ The Hi Hat, which had been the city’s “home of good food and fine liquors” now also added its being “the toast of Lowell” to advertising banners. 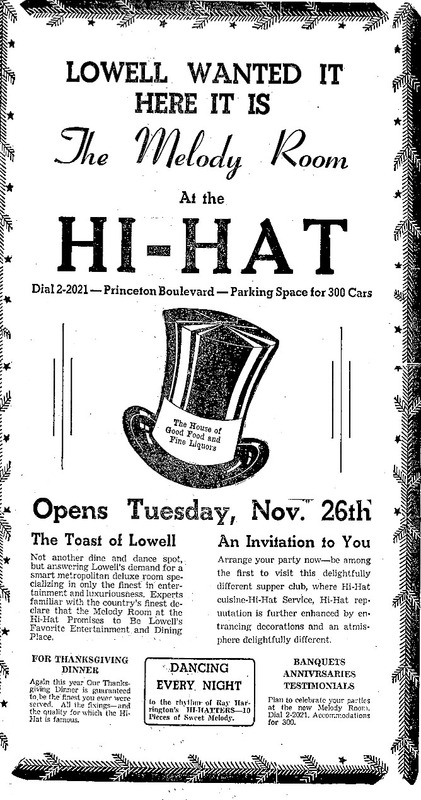 The Hi Hat was wildly successful during the 1940s, but as the decade drew to a close, Bill Goodnow told the Lowell community that he was looking to move on and retire, and he put the Hi Hat up for sale. He turned down one offer, received in 1950, saying he sought “lucrative enumeration for taking the place from a hot-dog stand to what it is now”. But the Hi Hat was already in the news in 1950. A lawsuit had been brought against it by Walter J. Perras, who alleged that the Hi Hat was responsible for some tough treatment he had received at the hands of local police when the Hi Hat had called them in to help with clearing the bar one night at closing time in January 1946. One man in Perras’ group, from New Jersey, said, after a night at the bar: “In New Jersey, our bars close at three in the morning.” When the bartender shot back an explanation reminding the men that they stood in Massachusetts where bars closed at 1 AM, the men finished their drinks, got up to get their coats and looked back at the bar to see the bartender instructing Lowell police to “see them off the premises”. He pointed at the men to make sure there was no confusion over who he meant. They also overheard him telling police that the men were not drunk, but were “feeling their liquor”. At this, the Lowell Police approached the men, told them to leave, and while one of the men bent over to put on his boots, a plain-clothes officer struck him multiple times, with blows to the head and body. The man recovered and survived, and developed the opinion that the force used to extricate him from the Hi Hat was excessive, and that the Hi Hat was responsible, since they had called the police in, in the first place. The courts didn’t see it the same way, though, and the Hi Hat was ultimately cleared of any wrongdoing in the suit. The fifties opened with the Whitneys taking over the Hi-Hat and presenting their plans for it to the Lowell Licensing Commission, amidst quite a bit of controversy. The Whitneys – Maurice, William, and Ester (later known as Ma Whitney), petitioned the city for permission to build an addition to the Hi Hat’s Melody Room, so that they could conduct both skating and dancing lessons there. Those against the plan worried at the amount of noise that adding a rink and its music would create. In the end, though, the Whitneys got their way, and built their rink. The Hi Hat Restaurant re-opened in May 1951, as the Hi Hat Roll-A-Way. While it was owned by the three Whitneys, Esther quickly emerged as the most visible owner, and become known throughout Lowell as Ma Whitney. The fifties wouldn’t have been the fifties at the Hi Hat Rollaway without her. In contemporary newspapers, and in memories posted to the Hi Hat’s Facebook page, Ma Whitney is best remembered skating the floor of the Hi Hat, keeping an eye on the skaters, and watching out for the rink’s newest skaters, on the practice floor. Everyone called her ‘Ma’, even her husband. And, if you heard the two short bursts from the whistle she wore around her neck, you knew you had caught her disapproving eye. Ma Whitney loved roller skating. In a 1956 Lowell Sun article, she explained that “roller skating is a No. 1 participation sport. It knows no age limits.” Although some of her neighbors outside would have disagreed with her, she continued. “The littlest tot enjoys [roller skating] as well as the person who would seem to be well out of active participation. It is good for older people. It gives them a chance to get the much needed exercise.” Maybe it would have made some of her older neighbors a little less crotchety too, if they had tried it. 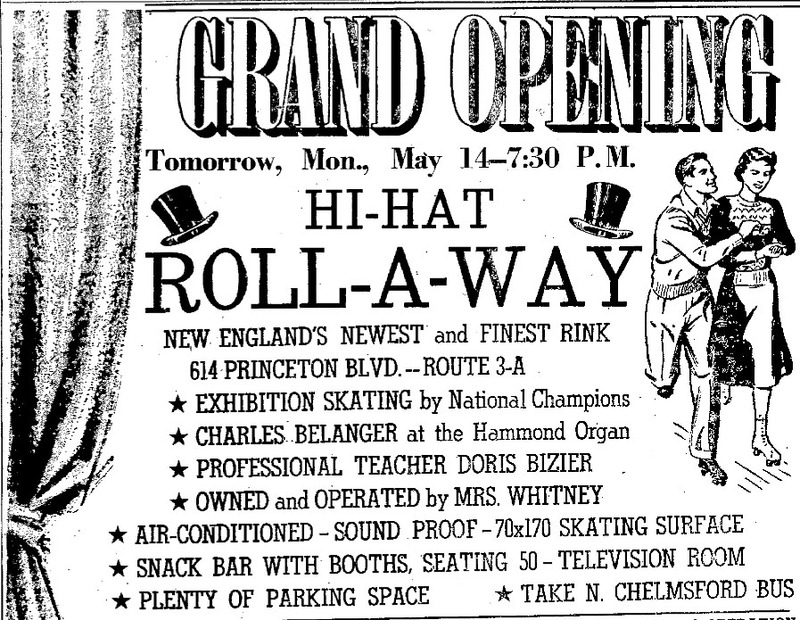 Ma Whitney was proud that the Hi-Hat Rollaway attracted not only skaters from Greater Lowell, but also brought in people from as far away as Southern New Hampshire, and Hampton Beach, apparently. Ma prided herself in maintaining a rink where parents could view their teenagers as safe. Ma herself was the mother of a champion girl skater, and held the Hi-Hat to the strictest and careful supervision at all times. Ma Whitney was also a good citizen too and very charitable too. She was well-known for raising money for the polio fund and the heart fund. By the sixties, ownership of the Hi Hat Rollaway had passed onto Maurice Rochette, or Mo as he is fondly remembered by the Hi Hat skating community on Facebook. 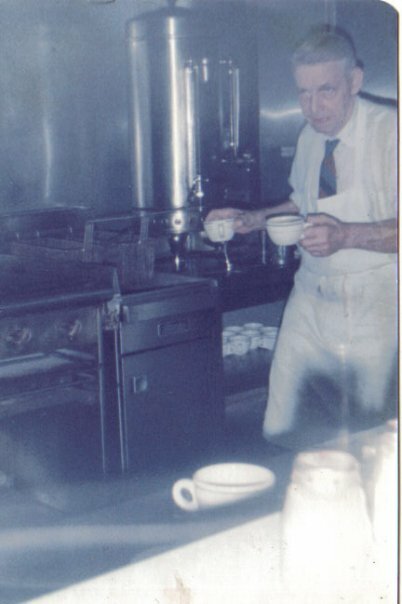 Mo also ran Rochette’s diner, and was a veteran of the Lowell restaurant scene. He was well-known for the food he prepared, and for being somewhat hard of hearing, especially in his later years. Mo is the inspiration for the Hi Hat Guy figurine we hold in our artifacts collection at the Lowell Historical Society, and the subject of this month’s earlier post on the Hi Hat. Mo saw the Hi Hat through its final 30 or so years, right up to its closing around 1990. Even though the Hi Hat has been closed for some 25 years, its memory lives on in generations of residents in the Greater Lowell area. 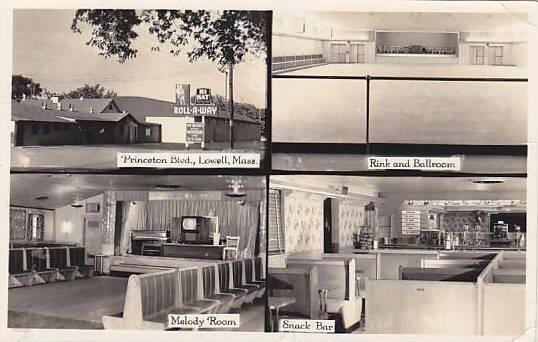 You can still see these memories emerge, occasionally, through the posts on the Hi Hat Skating Club Facebook page, or through periodic auctions of Hi Hat memorabilia on eBay, and even in the conversations with Lowellians as they drive by the Hi Hat’s former site, where condos now stand on Lowell’s Princeton Boulevard. Even though very little now stands in memory at that site, it’s obvious that the Hi Hat is fondly remembered among the Greater Lowell community. ** Special thanks to Brian Leahey of Lowell, who contributed to this post. thanks! joan PS We were neighbors who loved it! What a wonderous find! I’m thinking ’53-’55, Sat. afternoons for 40 cents for me! Saving up to buy double axles with ‘silent synthetic’ wheels. Lugging something like this http://tinyurl.com/n885lkd 2 miles each way. Yes indeed! Ma Whitney in her white polka dots on navy blue midi dress encouraging gals (after we did the Hokey-Pokey) to do “Lady’s Choice” and drag us guys out onto the floor. Oooeee! skating side-by-side/body to body with the ever so coquetish Maureen Botti (a “Couger” in today’s world) from D St. or enchanting Charlene Abrahamson from Ayer! Thank you Ladies!! Indeed a fine preparation for moving on in a year or so to record hops to dance…OMG….cheek-to-cheek in the stinky gyms of IC/Holy Trinity/Keith!!! Then the Commodore and the Totem Pole!!! So Sad…kids of today have missed out on such (safe) experiences!!!! God Bless, Thank ya, and RIP Ma! My brothers and friends loved walking to the hihat in the early 70’s for the afternoons and weekends, We had a blast I can still remember the Music and doing the one step over the other going into the corners and than taking a break and glide into the restaurant for a slice of pizza and a drink, Throws we’re The good old Days , John j McCarthy JR and Brothers . Thank you for a wonderful memory! My dad was a manager there when I was born. The Hat was a home to me and my family! Many days in the 70’s of roller skating and buying Ice cream from the old guy. I’ll always have those memories.